MonkeyPod, also known as a rain tree, is a type of a wood from Central and South America that is often found planted in many tropical areas. Monkeypod wood is usually a warm golden to a darker brown color. It often times has darker streaks worked within the grain. Some of the monkeypod wood from Hawaii will have a more red hue to it. HOW DID IT BECOME A MID CENTURY STAPLE? Hawaiian and tropical decor became all the rage back in the 50’s and 60’s (some say because of the aftermath of soldiers bringing home souvenirs from the tropics in WWII and other say it is because of the increased use of air travel during this time period). Regardless of the reason, tourist destinations, such as Hawaii, began using this wood to make popular souvenir dishes. 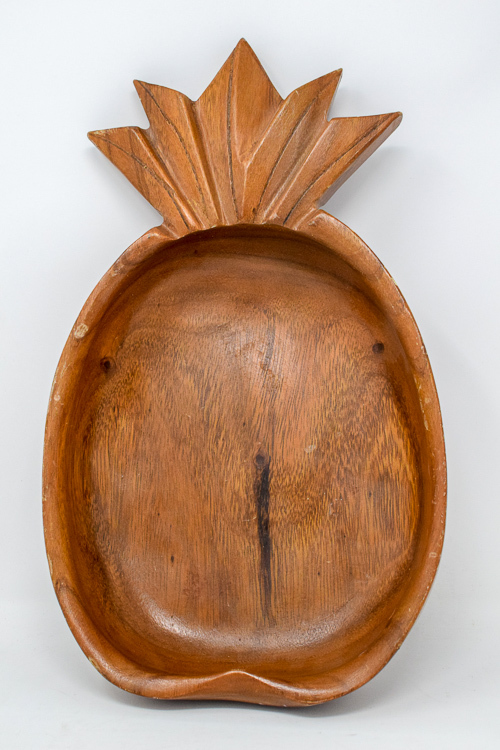 The famous pineapple dishes began popping up all over homes and so did the use of this wood. Looking for other quintessential mid century pieces? Then check out my Etsy shop here.